Originally published June 2007. Edited to expand on the topic. Post includes affiliate links. How to Teach Your Kids to Eat Anything…without losing your mind. A reader recently left a comment asking if my children would actually eat all of those vegetables (pictured in my Colorful Chicken Fettuccine recipe}. My children love vegetables. All ten of them. They are all excellent eaters, who will devour nearly anything without complaint. I don’t believe this is a coincidence or that we got “lucky”. First of all there are ten of them, not just two who are good eaters. Secondly, they come from 3 different gene pools, so you can’t claim it is genetic. I believe it is a matter of careful training. We have never catered to a baby’s taste. We have never been ones to rummage through the cupboards to find something a child will eat, whether the child is 9 months, 2 years, or 10 years. They eat the food provided, or they don’t eat. No normal, well-adjusted child* is going to starve himself to death. *in 2010 I gave birth to a baby who did starve himself. It turns out he had a heart defect requiring surgery. Our first sign that something was wrong? His inability to eat and gain weight. 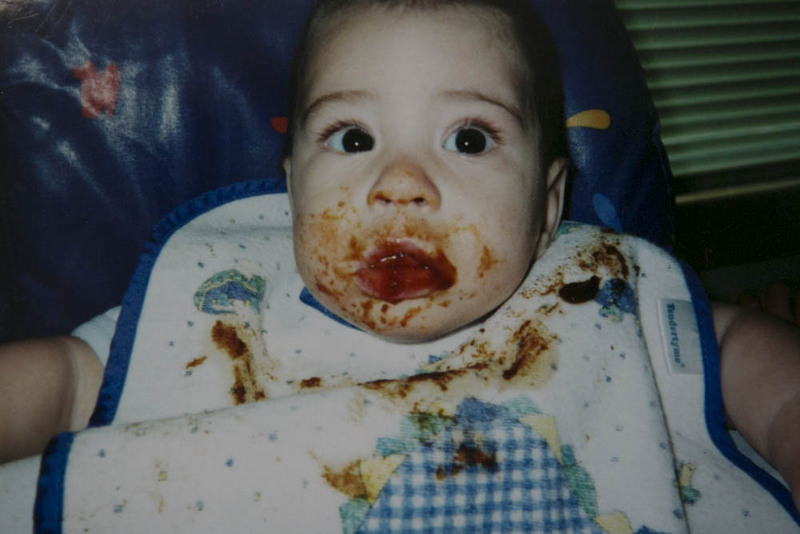 I distinctly remember Baby Number Four (Enoch pictured above) sitting in his high chair, refusing to eat what we were eating. 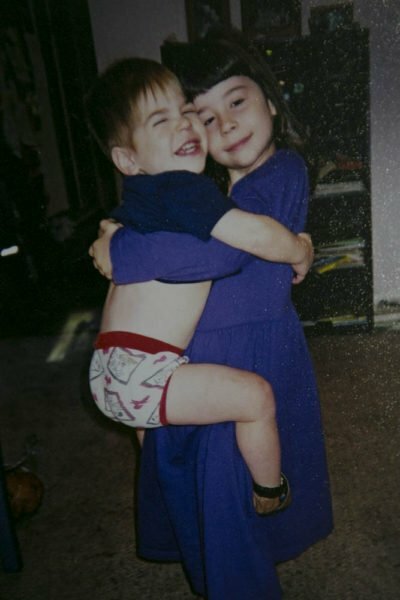 He was about a year old, and I was pregnant with Kalina. I remember at the time thinking if I weren’t so busy with the other three, if I weren’t so tired from pregnancy, I would probably have looked around until I found something he would eat. And he would have become a picky eater. No such luck, the poor kid. And guess what? He got over it and learned: you eat at mealtimes or you don’t eat. Here are the steps we have taken to create kids who eat nearly anything and you can use to get your kids to eat anything. Our bodies are designed to love sweet foods. Breastmilk is sweet. Offer broccoli before applesauce, carrots before banana. We always introduced soft, mushed vegetables into our children’s diets first. We didn’t offer fruit until the habit of eating vegetables was well established. Research shows a child sometimes needs to try a food 15-20 times before they begin to enjoy it. When our oldest was five she hated sweet potatoes with a passion. We ate them once a week or so and always put a “no thank you” helping on her plate. She would begrudgingly eat it and move on. One day my husband asked her if she wanted seconds on sweet potatoes and, much to our surprise, she said, “yes!” From then on, sweet potatoes were one of her favorite foods. She just needed time to learn. Had we only given it to her once, or twice or seven times, she would not have learned to like the food. Use “no thank you” servings. 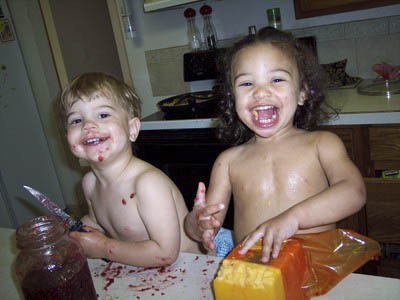 I learned about “no thank you” servings when our children were very young. This is basically a very small serving (a tablespoon or less) of a food a child doesn’t want to eat. For instance, if we were having sweet potatoes and Adalia didn’t want any, we gave her a “no thank you” helping. Once she had finished the food on her plate, she could have seconds of anything she wanted. Requiring our children to eat small amounts of food they didn’t like, helped expand their palates. No, they didn’t always learn to love the food, but over time they learned to eat foods they didn’t like without choking and gagging. I think we can all agree this is an important life skill. We made our children clean their plates. This is probably the most controversial aspect to our method. Yes, we make our children “clean their plates”. And no, I don’t believe for a second that is what makes a child overweight. Here’s the deal. We all eat dinner. Everyone has a little of everything (and a little is often a teaspoonful for the younger kids). We don’t “fill” their plates. We give them a little, and when they’re finished with what they have, they can have more of whatever they want. No one has to have seconds of anything, much less a food they hate. It is not unusual to have a fight over the last piece of broccoli or stalk of asparagus. Over time, beginning when they are very young, they try everything. I am a firm believer that tastes are developed. I’ve seen it happen with my own children. I’ve seen a food they detest but must eat become a favorite. They get used to new flavors and textures, learn to eat food they don’t like. 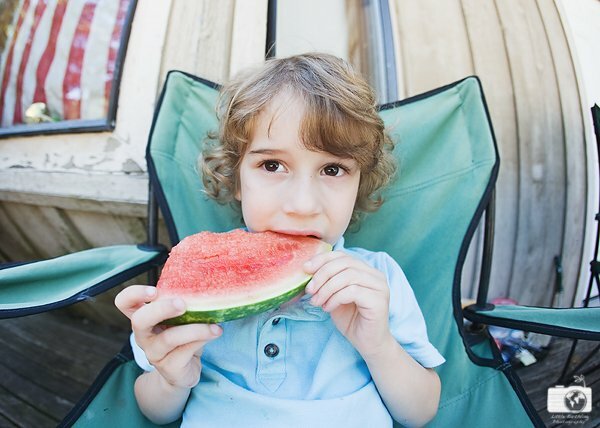 In this sense, eating a variety of foods is a skill children learn over time. 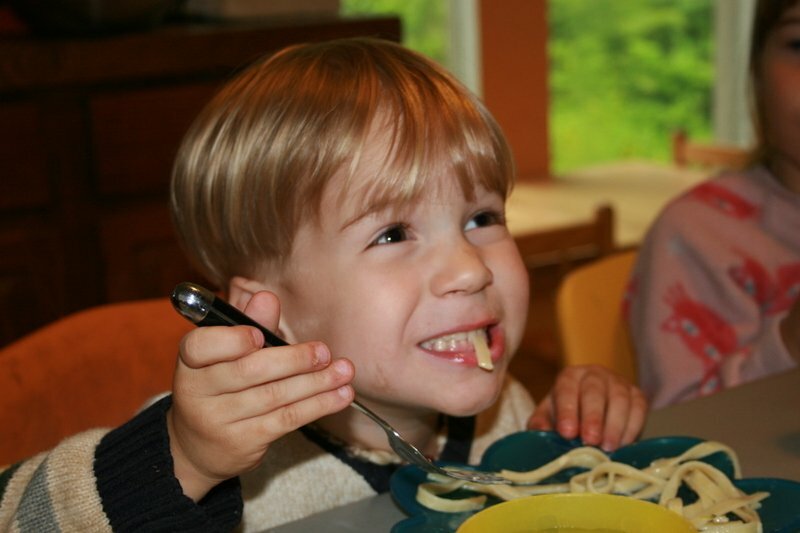 For more information here is a completely up-to-date list of our best picky eater resources. The thing that is tricky with the above statement (for me) is remembering that my little girl is not “normal” from a health perspective. And while she seems well adjusted in most ways–she’s not when it comes to food. We have always tried NOT to make food an issue. Just healthy snacks in the house. Never forcing her to eat. Never counting calories, etc. We knew prenatally to expect a cleft lip. We were told that it was “just the lip” and that “feeding wouldn’t be a problem.” I had an unmedicated birth to improve our chances of success. Except that my supply never really came in…due to the post postpartum hemorrhage (2 of them as it happened). And I never did get a blood transfusion…cause it would grow back. I didn’t want to pathologize something as natural as childbirth. And her lungs collapsed after birth leading to a week in the NICU. And at 10 weeks old my baby still wasn’t gaining weight…so we started on formula to supplement breast milk. All my La Leche friends swore it would make her fat…ha! After her cleft repair she wouldn’t eat. Routine chiropractor visits got that back on track…but at 18 months she weighed 18 lbs…which is what she weighed at 15 months. So with a diagnosis of failure to thrive and some other scary test results we are yet again on a “not normal” path. Samantha- I totally understand what you mean. None of what I wrote five years ago applies to Apollo. While no “normal, well-adjusted child” will starve themselves, Apollo will 🙁 He was failure to thrive. He gained NO weight from ages 4-7 months old. After that he gained very, very minimally until he had his tube placed. I know how hard all this is, probably the hardest thing I’ve ever done. Best of luck to you and your daughter. One of the things I love about your family is how you clearly approach each of your children as individuals with their own set of needs, gifts, and challenges. It’s helped me adapt to the challenges my little one presents. I have to remember that I’m not parenting “a child” but “this child”. Yes, there is no perfect “formula” unfortunately. If we had no food allergies, I would agree with your method. However, I have a severe peanut allergy, as does #4. 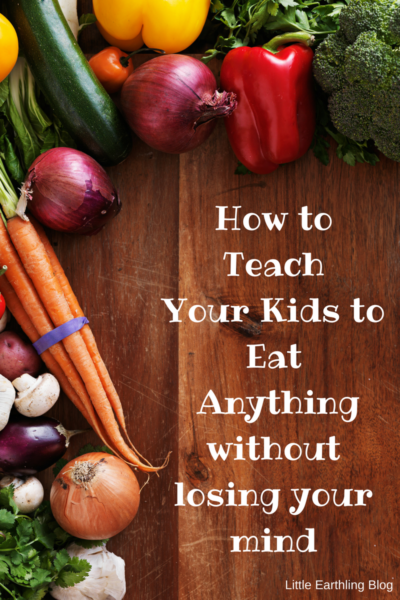 If my kids do not want to eat something, I choose to let them, especially when they are not verbal. #’s 9 and 10 would projectile vomit if I ate any dairy when they were small and nursing frequently. They still do not like milk. #10 at almost 4 can now tell if something she tasted made her mouth itch. She does not eat peanut butter either. Yup, that’s where the “healthy” part comes in. Or maybe in your case, “typical” would be a better words. Adalia and Judah didn’t tolerate dairy as babies/young children either. For years, Judah wouldn’t willingly touch a piece of cheese…he will enjoys it now, but still doesn’t like cream cheese, sour cream, cottage cheese, etc. I was an extremely picky eater as a child and have had to “train” myself as an adult. We have followed your advice with our 4 and 3 year old girls, and it is so nice to see them eat whatever we’re having for dinner, usually vegetables first because broccoli is one of their favorites. Our 11 year old son has Asperger’s and the majority of his sensory issues that he has left are related to food. He has tried to eat what we eat and he often ends up vomiting, so we gave up on that. The foods he will eat have to be basic. Often he can eat everything we’re eating, but combining them into stir-fry or a casserole make it impossible. He does love lean meats, whole grains, fruits and raw veggies. Our 11 year old Liberian daughter has always eaten anything. I was already reading your blog when we had our younger daughters and it makes life so much easier to have them eat regular food. The only issue is that if we go out to eat they don’t like any of the unhealthy stuff that’s typically on the kid’s menu. Thanks for sharing. And I believe you made the right decision by understanding your son’s issues. I have a very similar approach, and even though I only have two children – I have similar results. Something you didn’t mention, but I think is also a key to having non-picky eaters, is eating all together as a family, at the table. While that may be standard for your family and my family, sadly, it is not in many homes. People eat in front of the TV, or on the run. 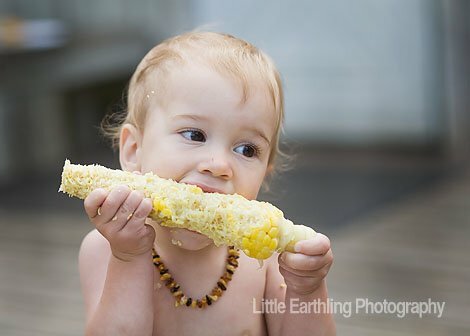 It’s important, especially for babies and toddlers, to see everybody eating all together, and they want to eat what everybody else is eating. When babies and young children are in a high-chair off in the corner, and not participants in family dinner, they miss out on learning by example, and getting in the habit of eating at meal-time. Our oldest, who is five would definitely be pickier if we did things differently and allowed it, and it some times takes some strong encouragement to get him to try something new, but he does have to try one bite, even if he doesn’t swallow it. He’s frequently surprised by the fact that something he thinks is “gross” when he looks at it, is “yummy” when it finally ends up in his mouth!